With February in full swing, it sure feels like love is in the air. If you’re an RVer, you may agree that your motorhome or travel trailer is one of your loves in this life, so why not treat it like one? In this blog we will share with you some common maintenance tips that can go a long way towards extending the life of your coach. Make it a priority to check your door and window seals every few months to ensure that they are in good condition, as well as your roof seals once every six months. The last thing you want is mold in your motorhome, so check for any cracking, which can allow water and moisture to get in. If you see any signs of deterioration, it is recommended to get them replaced immediately to keep both you and your RV in good health. Regular exercise of your RV generator is key. Before turning on your generator, make sure to check oil levels, as low amounts can cause a great deal of damage to your generator. Refer to your generator owner’s manual for information on how often service is needed and what items you can perform on your own, as well as which services require a visit to a repair shop. Run your generator for a couple hours each month to keep fuel flowing and ensure you’re always ready for your next trip! With a few simple maintenance tasks, you can keep your RV tires in good shape, lasting longer, and most importantly, keeping you and your passengers safe on the road. Always check your tires’ air pressure and only measure when they are “cold”, meaning not right after driving, as hot tires can give off inaccurate pressure readings. Check your tires occasionally for any cracking or deterioration and if in doubt, head to a repair shop to get a professional opinion on replacing your tires. Give your home on wheels some TLC by washing it when needed. Having a clean RV will keep away damage-causing-grime and other elements such as saltwater, sand, and even bird droppings, which can have harsh effects on your home-on-wheels. Having your RV waxed 1-2 times per year can also keep up the shine and quality of your exterior. Just like your regular automobile, your RV’s oil must be changed according to industry recommendations. RV makes and engines are not all alike, which is why you should check with your coach’s manufacturer for when oil changes should be performed. The average gas engine typically goes up to 5k miles before an oil change and up to 10k miles for diesel engines. Well there you have it, folks! We hope you will take these maintenance tips to heart and give your RV the love and care it deserves. For any maintenance items you can’t perform yourself, you can use RV Repair Direct to find nearby RV repair facilities to help you out. 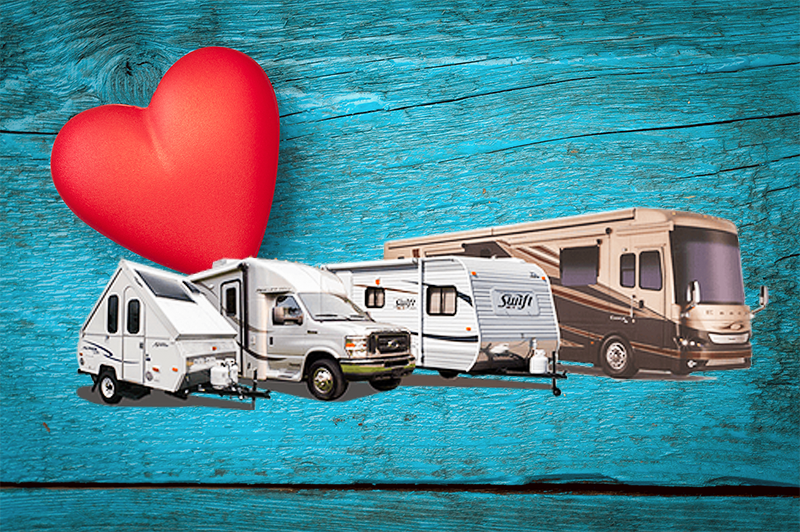 Once your RV is in great condition, take your sweetheart and other loved ones out for a Valentine’s Day adventure! Happy traveling from all of us at RV Repair Direct. They often come with warranties of up to 40 years, providing your RV s roof a lifetime of protection. When it comes to RV maintenance tips, RV roofs tend to get alot of attention as they are especially susceptible to sun and environmental damage, which can create problems that often go unseen because we simply don t get up there regularly. Steel RV covers can be installed on your property and customized to meet the size of your specific vehicle.